Trump's threat comes as the secretary of state preps for a trip to the region. President Donald Trump is warning Central American countries to stop a caravan of migrants heading toward the U.S. southern border or face an end of U.S. foreign assistance, touting his blustering stance on immigration as a winning campaign strategy for the Republican Party in the 2018 midterm Congressional elections. But his threat comes as Secretary of State Mike Pompeo is preparing for a trip to Central America to improve ties with those regional partners and mitigate the issues that drive so many migrants to make that journey north – the very programs the president is now threatening to cut. 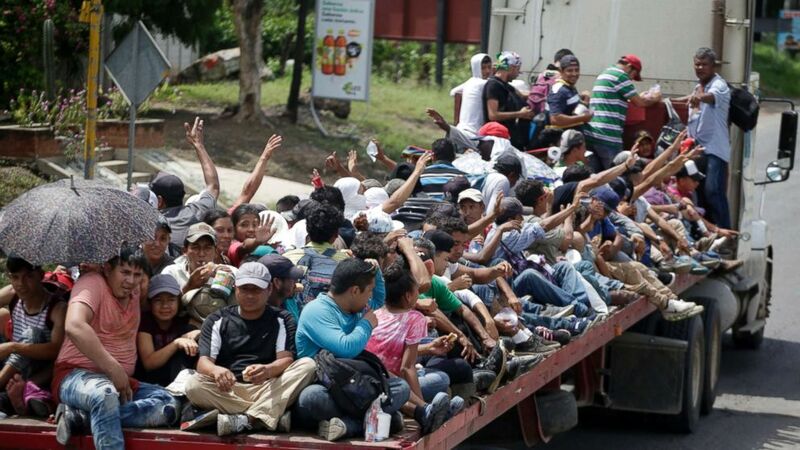 More than 2,000 Honduran migrants traveling together to the U.S. since Saturday resumed their journey on Wednesday, hours after Trump's first tweet came. He added a shot at Honduras, Guatemala and El Salvador. The Trump administration has tried to get those three countries, sometimes collectively known as the Northern Triangle, to step up their border security. But it's unclear how much they can do to stop the thousands that flee because of the violence, poverty, and lack of opportunity at home. In fact, the United Nations High Commissioner for Human Rights urged Honduras, Guatemala, and Mexico to respect their rights and ensure their safety on their journey. Nevertheless, Central American countries are taking at least public steps to halt the caravan. Exactly how effective they will be in preventing the migrants from continuing north remains to be seen. The latest move comes from Mexico, which issued a statement Wednesday warning that anyone who enters the country illegally will be processed and returned to their country of origin. On Tuesday, after Trump’s tweets, Guatemala detained the Honduran organizer and the Honduran Foreign Ministry called on its citizens not to join the group, according to Reuters. Honduras’ president said in a speech Tuesday night that some in the caravan had already returned home. Despite Trump's threat, Vice President Mike Pence and other senior administration officials have been pushing efforts to increase prosperity and security in Central America in order to reduce the flow of migrants. A possible detriment to that, however, is the administration's cuts in funding to all three countries, beyond Trump's warning that he would bring those numbers to zero. "We are committed and have been continuing to put in the resources to fund programs that we hope will address the root causes of migration and help people thrive at home," a senior State Department official told ABC News Wednesday. Trump remained focused on the caravan's movements Wednesday, turning it into a political issue and taking the opportunity to bash Democrats over immigration. "Hard to believe that with thousands of people from South of the Border, walking unimpeded toward our country in the form of large Caravans, that the Democrats won’t approve legislation that will allow laws for the protection of our country. Great Midterm issue for Republicans!" he tweeted. (Moises Castillo/AP) Honduran migrants who are traveling to the United States as a group, get a free ride in the back of a trailer truck flatbed, as they make their way through Teculutan, Guatemala, Oct. 17, 2018. Migrants themselves, however, have not been discouraged by Trump's tough talk or policies, including his zero-tolerance border policy that resulted in the forced separation of children from their parents or his changes to the definition of who qualifies for asylum, ruling that claims of domestic or gang violence were no longer valid grounds. "We are going to continue... We have no other option but to move ahead," Luis Navarreto, a 32-year-old migrant in the caravan, told the Associated Press Wednesday. That undeterred desire is borne out in statistics, too. Border patrol agents arrested 16,658 family members in September, the Washington Post reported Wednesday, citing unpublished statistics from the Department of Homeland Security -- marking the highest one-month total on record and an 80 percent increase from July. "For these migrants, the idea of being separated from their children, or being locked up together, is horrifying, traumatic, and incredibly painful, but the alternative – staying home and risk being killed – is worse," said Maureen Meyer, the director for Mexico and migrant rights at the Washington Office on Latin America, or WOLA. That's why, instead, top administration officials acknowledge more must be done to combat the root causes of that migration. To that end, Pompeo will visit Panama on Thursday and Mexico on Friday, where he is expected to focus on this, among other issues. While Trump has talked tough, Pompeo and other senior administration officials have tried to work with Mexico and the Northern Triangle countries to increase prosperity and security in their countries. Last week, the U.S. co-hosted with Mexico a two-day conference that included Pence, Honduran President Juan Orlando Hernández, Guatemalan President Jimmy Morales, and Salvadoran President Óscar Ortiz. Pence announced all three countries had committed to increasing their border security forces, but he called on each to vocally urge their citizens not to make the dangerous journey north: "If they cannot come to the United States legally, they should not come at all, and say it with strength and say it with passion as neighbors and as friends because it's the truth." But while he called on those countries to each "do more," they were quick to turn around and point to U.S. funding cuts. In 2016, the U.S. provided $209.2 million to Honduras, $254.4 million to Guatemala, and $153.1 million to El Salvador, but in 2017, those numbers dropped to $181.8 million for Honduras, $177.8 million for Guatemala, and $149.1 million for El Salvador, according to the research and advocacy organization WOLA. When asked about the cuts last week, another senior State Department official told ABC News, "I wouldn't obsess too much on the dollar figures. It has to do with using our resources wisely and in a cooperative manner." But the changes seemed to bother Central American leaders, with President Hernández of Honduras telling Pence and Pompeo during the conference, "Every year there is a reduction in the resources that are budgeted by the United States. This should not take us to the conclusion that you have lost interest in your relationship with me, but it does concern us... We need to have assurances that we will have the necessary budget." Hernández is as responsible, however, after his violent crackdown on political opposition following his reelection win in November 2017 has sent many Hondurans fleeing. The Trump administration has shut down legal pathways for folks to come to the U.S., including the Central American Minors program that reunited children left behind with parents legally residing in the U.S. They've also changed the definition of who can qualify for asylum, forcing many who reach the border to be turned back or deported -- some of whom then try to cross illegally. Among the solutions the administration is still pushing is transferring $20 million to Mexico to have them deport migrants back to their home countries. Despite opposition from Congress, Mexico's current President Enrique Peña Nieto, and incoming president Andrés Manuel López Obrador, the State Department says it is still considering that plan and says it will work with López Obrador's incoming team to make it work. Trump made similar threats to cut funding in April after another caravan moved through Central America, but he never followed through.